Last year I switched from Nikon to Canon due to a yearlong battle with Nikon Service for their inability to repair or provide a D800 that focused worth a damn. During the transition I quickly became accustomed to the Canon way of doing things, for the most part the transition was smooth. However, the one thing that bothered me about the Canon system was the flash, the Canon ETTL system uses a A:B ratio system and a third C group, plus flash compensation. Kind of a hassle and to make things worse it was either ETTL or manual flash, it did not allow for mixed settings. 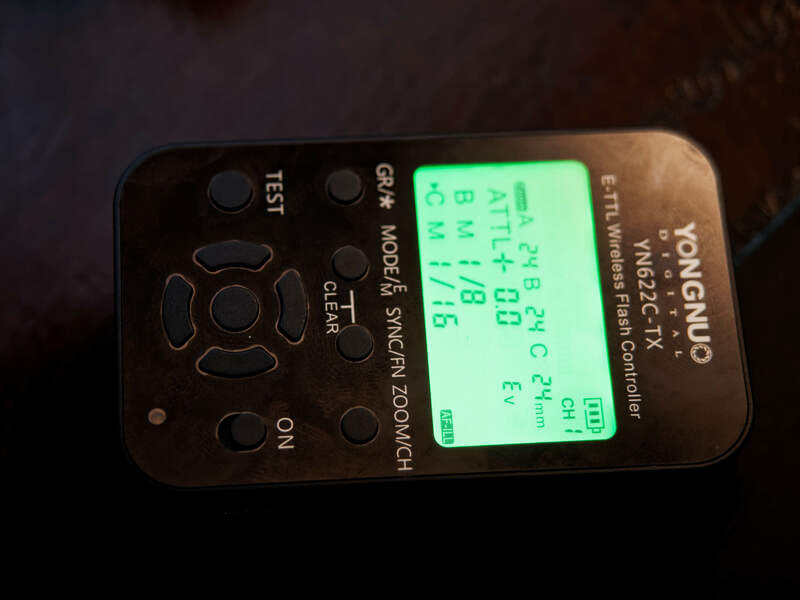 One step toward solving this problem was Yongnuo’s radio trigger YN-622C, the YN allowed me to mix lighting, but it did require that I walk to the flash(s) that are set to manual for changes. If I had all the speedlites on ETTL or Manual, I could control this remotely using the camera’s “External Speedlite Control”, which in itself a bit bothersome for fast changes. Another shortcoming of the Yongnuo’s YN-622C was that 2nd shutter curtain would not work with external flashes, this seems minor until one wants to drag the shutter in reception dance’s. Other than the few issues mentioned and an occasional misfire that required resetting the triggers (but nothing compared to the PW Flex misfiring issues), I have been very happy with the YN-622C. When I read rumors of the Canon YONGNUO – YN-622C-TX last year I was excited because it looked to solve all of the issues I had with the system. Months passed with no release date that I began to wonder if the Canon version was vaporware, I knew the Nikon version came out a few months ago but that did me little good now. Well my YN-622C-TX finally arrived yesterday and here my initial impressions. – The is no more A:B plus C ratio system. 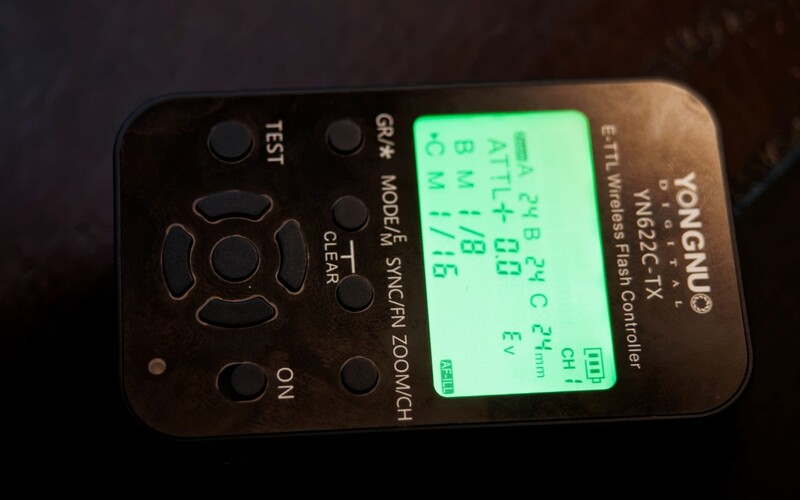 – It is back to my more familiar A+-3, B +-3, C+-3 TTL modes. – Flash compensation is easier than ever thanks to clicking L/R arrow for 1-stop increments and U/D for 1/3 increments. – The external flash zoom control does not seem to be working. More tests will be needed. The new benefits will come in handy in wedding receptions, but there are a few things it did not solve, but it probably has more to do with the flash (550EX) than the trigger itself. Last year I bought a brand new in box 550EX because the price was just too good to pass up. I bought thinking I would only use it in manual mode, but it turned out the YN triggers were able to use it in ETTL mode, but the triggers cannot remotely control the manual settings. I was hoping the TX would have resolved this, well it works the same, ETTL only and 2nd Shutter Sync does not work either. I was a bit disappointed so I read the manual for solutions. 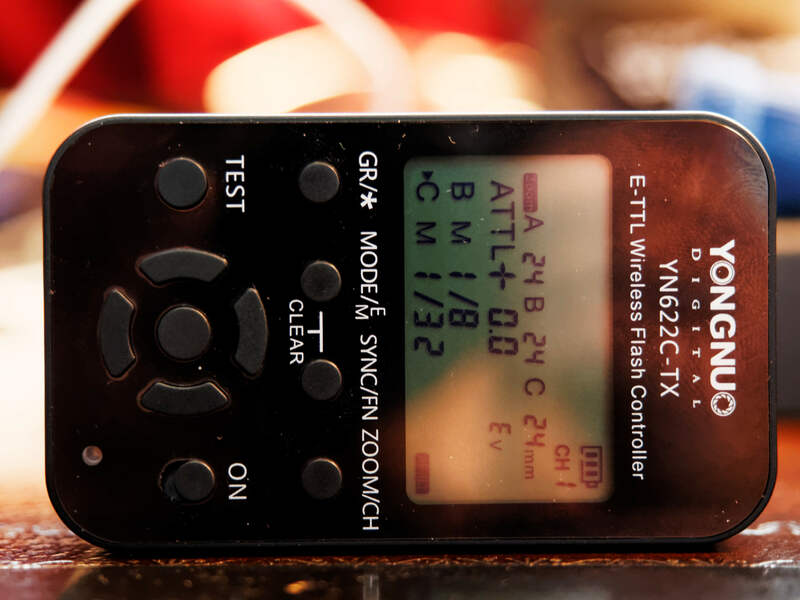 I saw that it has a legacy flash custom function, but when turned this on, my newer flashes triggered at full power, I did not even bother doing more tests because I have three newer speedlites and I would not be in a situation where I would use this. Initial tests are favorable. When I tried ATTL-0 & BTTL-2 the ratio looked good, and when I did ATTL-1, -2, -3, the flash compensation was noticeable. This means I no longer have to set A:B and then Flash compensation. NICE! Another nice thing I noticed is that the settings remain the same when turning off and on. 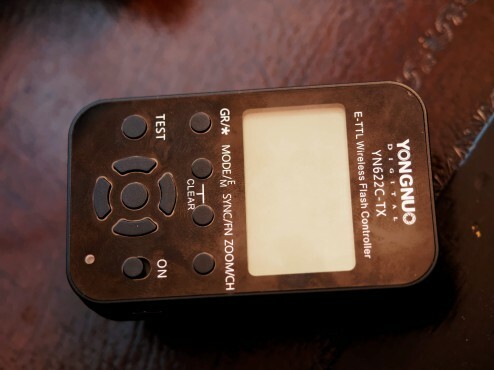 The camera’s “External Speedlite Control” settings would timeout after sleep mode or any extended time of none use. This used to really irk me, but not anymore. Best of all I only paid $58 for this marvel of convenience and I am now seeing them on eBay for even less. Since I just received this yesterday I will need to run more test to ensure reliability before using it in actual weddings, I will try to upload some photos from these tests in the coming weeks along with a complete review.